This week I want to look at VO2 and SmO2 response to one of my favourite VO2max workout protocol. We will see how systemic metabolism responds to hard-start VO2max intervals. The experiments were fascinating and I’ll try to give some recommendations to dial in your own individual workout prescription. The principle of the hard-start VO2max interval is to set off at a very high intensity in order to rapidly reach near VO2max (for which 90% HRmax is a good target for most people). Power can then be slowly decreased so that HR (and VO2) remain near-maximal, but the workload can be sustained for 5+ minutes without blowing up. Set off at extreme-intensity, ie. at a power above your VO2max workload (>PVO2max). This should elicit 90% VO2max within ~90 seconds for most people. 90% HRmax is a target that correlates decently well to 90% VO2max for most people. Once above 90% VO2max or HRmax, begin to decrease the workload so that you remain above that 90% target, but you can sustain the full prescribed duration (6+ minute intervals at >90% VO2max should be possible). Work intervals can be maintained longer, because the decreasing workload accounts for VO2 slow component and decline in gross efficiency due to fatigue. So more time can be accumulated >90% VO2max. Recovery intervals can be longer than the typical 1:1 work/rest, because the hard-starts are more effective at rapidly stimulating aerobic metabolism. So we aren’t as concerned with letting VO2 drop between work intervals. This should allow longer work intervals and more repetitions, again allowing greater accumulation of time at >90% VO2max. With that reminder of SmO2 & VO2, let’s jump right into the metabolic data for a 3x6min VO2max workout that perfectly demonstrates the benefit (and the challenge) of a hard-start interval. Note: unfortunately the VO2mask ran out of batteries before the third interval! On the first interval the athlete tried a half-hearted hard-start (indicated by the arrows). Power wasn’t high enough to stimulate the aerobic system as quickly as it could have been. As a result HR & VO2 only rose to ~80% of max in the first 90 seconds. 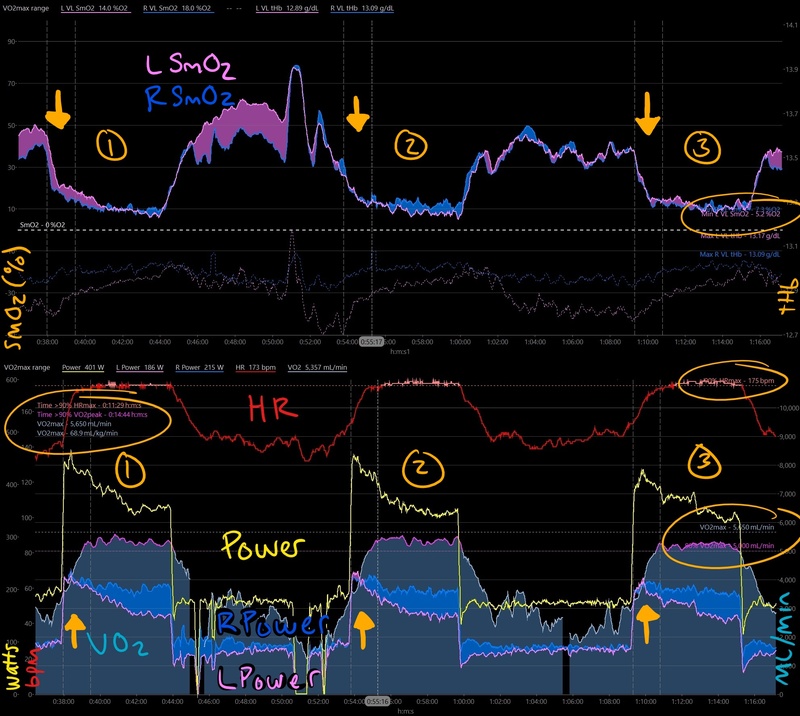 The athlete only reached 90% HRmax and VO2max near the end of the 6min interval (highlighted along the respective HR & VO2 lines in the bottom chart). Muscle oxygenation (SmO2 in the top chart) also gradually trended downward during the interval to a minimum at the very end of the interval. For the second interval I took control of the athlete’s smart trainer and raised the hard-start power target significantly! 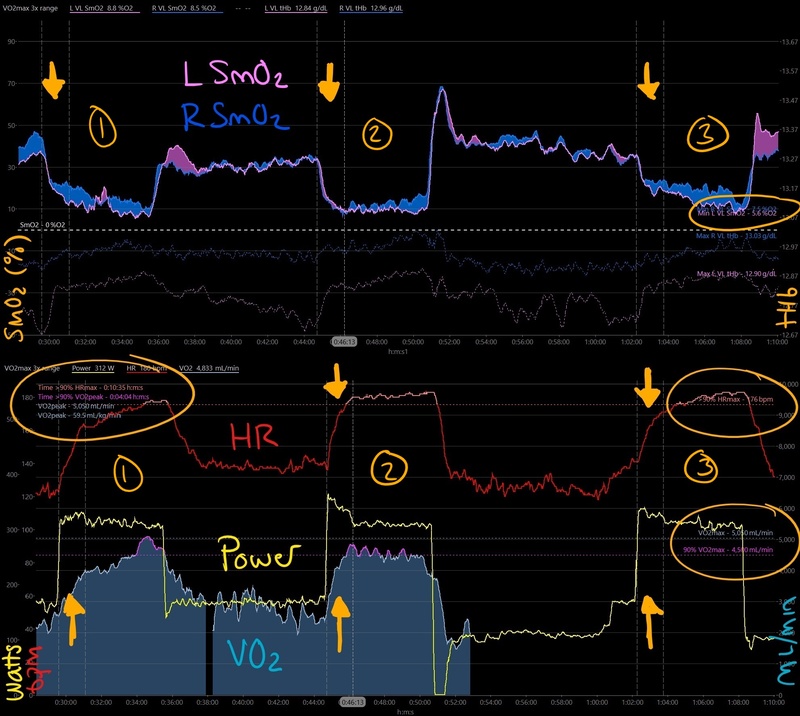 This time the interval started at 355 W instead of 325 W. The athlete reached 90% HRmax & 90% VO2max rapidly, and de-saturated SmO2 to a minimum within the first 90sec. I manually adjusted resistance down as the athlete approached the target, and all metabolic values stabilized around their target values. Average power after the hard start was the same in the first two intervals. The only difference was a harder-start on rep #2, and the athlete was able to accumulate more time >90% HRmax (1:23 vs 5:10) more time >90% VO2max (1:44 vs 2:20) and more time at minimum %SmO2 (although I don’t have exact targets for SmO2 yet). Average VO2 for the 6min intervals was 82% of VO2max in rep #1 compared to 86% in rep #2. Although this could still have been higher to make these intervals even more productive. Notice the third hard-start was subdued like the first interval, and again HR shows a slower rise toward 90% HRmax, instead of the rapid rise and plateau observed in the second interval. Likewise SmO2 shows a similar trend to the first interval, with gradual de-saturation to a minimum, rather than rapid de-saturation and plateau at that minimum. I suspect we would have seen a similar trend in VO2, with a slower rise toward 90% VO2max and accumulated time >90% VO2max somewhere between that of reps #1 and #2. This workout was able to demonstrate the difference between a hard-start and a… hedged-start strategy in stimulating the aerobic system up to maximal, and accumulating time at our target metabolic states of >90% HRmax, >90% VO2max, or minimum %SmO2. Hard-starts must be hard, with intensity well above what could be sustained for the entire interval duration in order to maximize metabolic training stress of the interval. We also demonstrated that for this athlete, 90% HRmax seemed to slightly over-predict 90% VO2max. As in at 90% HRmax, the athlete was slightly under 90% VO2max. They were able to sustain >90% HRmax for over 5min during the second interval while hovering just about at 90% VO2max, but strictly speaking only accumulated 2.5min at or above that target. The athlete above showed the typical hard-start VO2max interval, where after the first 90 seconds the interval workload more or less stabilized at a steady power output. But of course I have to share what my own intervals look like when blood flow restriction begins to affect my Left leg. Spoiler: systemic metabolism remains elevated, but power output decreases dramatically. No hedged-start for me! I have experience with exactly what intensity works for me, so I jump straight into a very hard-start. Again the first 90sec is crucial, and I am able to get HR up nearly to 90% HRmax. More importantly, VO2 reaches 90% VO2max and remains elevated for the entire remaining interval duration. Looking at muscle oxygenation, SmO2 still shows a more gradual decline through the first interval. All three 6min intervals are very consistent in time accumulated above 90% HRmax and 90% VO2max, and for SmO2 de-saturation. One interesting comparison to the other athlete above, is that for me 90% HRmax seemed to slightly under-predict 90% VO2max. Total time accumulated >90% HRmax was 11:29, compared to 14:44 above >90% VO2max. However, instead of power stabilizing after 90sec, my Left leg (pink power line in the bottom chart) continues to decline as blood flow and oxygen delivery becomes restricted. Meanwhile my Right leg (blue) takes over and maintains a more stable workload. 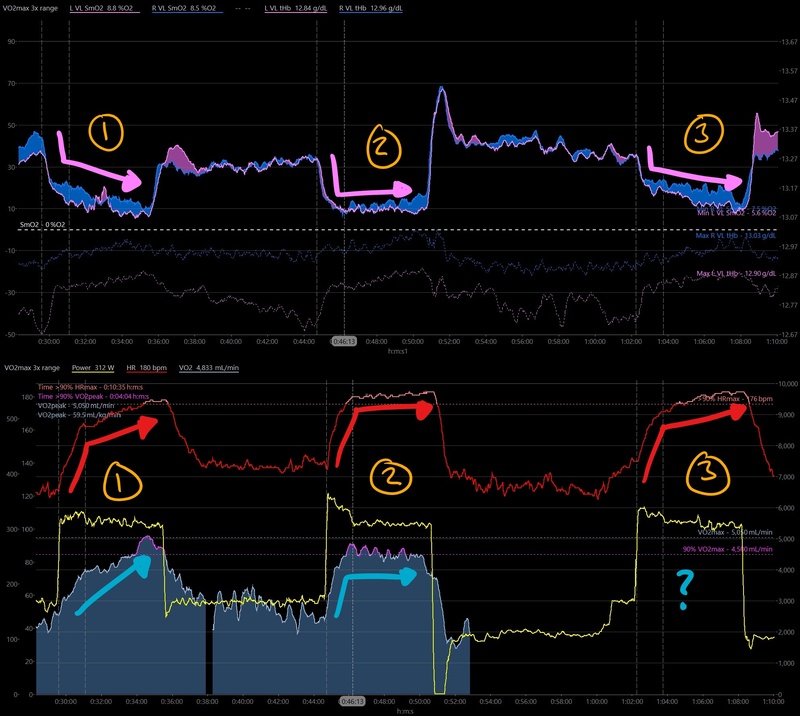 The net result is that overall power output (yellow line) decreases steadily through the entire interval. My power output through the hard-start interval declines by over 25%, compared to the athlete above who stabilized with only a 15% decline. Hard-starts must be hard! Worth repeating. Two similar workouts by two different athletes show the difference in metabolic response, especially in how well HR correlates to VO2. I would still suggest 90% HRmax is a good estimate of 90% VO2max for most people, but your individual response will vary. If you are training at home with power & HR, HR should rapidly reach a peak in the first 90sec of the interval (some people may be faster) then plateau for the remainder of the interval. Power may also plateau or continue to decline after that initial 90sec. I wonder how long these VO2max intervals could be maintained before either exhaustion, or VO2 cannot be sustained above 90%? Billat et al, 2013 found subjects were able to spend over 20 minutes continuously above 90%VO2max! So there may be room to push these 6min intervals further. Bonus recommendation from experimenting with VO2 measurement: try to focus on full, steady breathing throughout the interval. Starting to hyperventilate (faster, shallow breaths) is a sign that anaerobic metabolism is driving systemic response, and VO2 will measurably decrease. We’ll look at this in more detail soon. Check out the comparison between these continuous VO2max intervals and 30/15s intermittent microbursts in the next post. first of all thank you so much for sharing such great insights. I have read almost all scientific papers on cycling that I have found over the last two years. However, coming across your blog has provided me with great new insights. I love the idea with hard start intervals and have personally tried the 30/15 on my own already before by starting harder in the beginning to get my heart rate up to > 90% of max as soon as possible. Those intervals worked great for me. But I have to say I never followed this idea of hard start intervals consistently and applied it to my continuous workouts, which I definitely will do now. 1) In previous posts with reference to Diagnose Berlin there was mentioned that time of heart rate > 90% is probably not a good indicator for time > 90% of VO2max. In an earlier post you say it is a reasonable approximation for many athletes. Given your experience with the Vo2master and other analyses now, would you say that heart rate is a good indicator for “ranking” workouts in terms of their effectiveness? I have compared several workouts and the 30/15 protocol gave me the highest time with my HR > 90%, so I was thinking that this might be a great workout for me. But obviously if HR is not a good indicator for VO2, this would be problematic. 2) In terms of comparing continuous vs intermittent workouts with hard start, have you already come to a conclusion what works better and are there high individual variations between the athletes you have worked with? I think individualization is probably still an open point as even the most well documented HIT protocols in research also have few or several non-responders (although reasons can be broader like having not the best condition, being slightly ill, tired, personal issues etc). The ability to track time > 90% of Vo2max for different workouts might be a good tool to find out which workout protocols gives you the strongest signal for adaptation on an individual level. This might be 30/15 for me or continuous work for someone else. Thanks again and keep up with this great work. 1) Check back tomorrow actually. I’ll have a post going up comparing HR & VO2 for the hard-start 30/15 microburst workout, and comparing back to this look at continuous power intervals (eg. 3x5min). From the minimal data I have, plus the Diagnose Berlin data, It seems that 90% HRmax correlates fairly well to 90% VO2max in continuous power intervals, but less well in intermittent microburst intervals. I say in the post that I suspect this is due to the faster on/off kinetics of VO2 vs HR, so that VO2 drops below 90% during the 15sec rests, while HR may remain elevated above 90%. 2) But from what I’ve seen so far there do seem to be responders and non-responders. In the sense that some athletes find it more difficult to reach 90% VO2max/HRmax rapidly (within 90sec) without blowing themselves up on the hard-start. My first thought like yours was that maybe these athletes were carrying too much fatigue or stress, or not enough carbohydrate fueling into the workout, or other transient factors. But it could be that these athletes have a combination of A) slower VO2 onset kinetics, so they take longer to stimulate their aerobic system up to near-maximal. And B) lower work capacity above CP/FTP, so they ‘deplete their battery’ before their aerobic system has time to ramp up. As I’ve been learning more about SmO2 and how to stimulate peripheral working muscle metabolism (mVO2), I think it should be possible to gradually ramp the workload up at the same rate as aerobic metabolism (ie. over ~90sec) to avoid the expenditure of anaerobic work capacity at the beginning of the hard-start interval. But then I guess it couldn’t be called a ‘hard-start’ interval any longer!